Watching Palin And Taking Notes : Tell Me More Guest host Deborah Amos blogs about how, like Hillary Clinton, Sarah Palin is changing how people think about politics. After talking politics non-stop for the past two days, I realize that much of this election is riding on a woman ... again. This is another interesting twist in a political contest that has been unpredictable from the start. Alaska Governor Sarah Palin seems like the very opposite of Hillary Clinton, in terms of her policy choices and the causes she advocates. Of course, Palin is younger, and takes more risks when it comes to her public presentation. But, like Hillary, she's billed as "tough," a reformer, a champion of conservative causes. But the more I think about it, we really don't know much about Sarah Palin. So far, it's all media projections and official campaign statements. 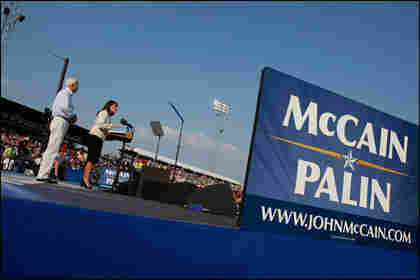 After all, it was the McCain campaign staff that made the announcement that Palin's 17-year-old daughter is pregnant. On Tell Me More today, I interviewed three women -- Ellen Moran, Janice Crouse and Ambassador Swanee Hunt -- who don't agree on much when it comes to politics, but they all agreed that it is "exciting" to have a woman in the race. Part of that excitement is the novelty. I interviewed Nancy Pelosi a few weeks ago. When she first became Speaker of the House of Representatives, she said that "the first woman" distinction was often attached to her job description. There came a time, she said, when most people dropped the extra definition because, well, it seems her role had become a normal part of politics. She was defined by her stand on issues, not by her gender. Tonight is the first step in this direction for Sarah Palin. For the first time, she will speak to a national audience. And for the first time, we will get to know her beyond the media hype and campaign spin. I am looking forward to settling in tonight in front of the best "reality show" on television. I plan to listen very carefully to Sarah Palin's speech. I want to know what she stands for. I want to know how she thinks, not as a woman, but as a politician. And by the time this election is over, I hope having a woman in a presidential race is just a normal part of any campaign.